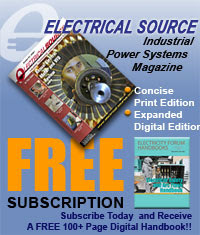 As the fault impedance is less than load impedance, the fault current is more than load current. If a short circuit occurs the circuit impedance is reduced to a low value and therefor a fault is accompanied by large current, Over current relays sense fault current and also over load current. Over current protection is that protection in which the relays pick up when the magnitude of current exceeds the pick up level. The basic element in over current protection is an over current relay. - Directional over-current protection (of above types). Over-current protection includes the protection from overloads. This is most widely used protection. Overloading of machine or equipment (generally) means the machine is taking more current than is rated current. Hence with overloading, there is an associated temperature rise. The permissible temperature rise has limit based on insulation class and material problems. Over-current protection of overloads is generally provided by thermal relays. Over-current includes short circuit protection. Short circuit can be phase faults,earth faults or winding faults. Short circuit current are generally several times (5 to 20) full load current. Hence fast fault clearance is always desirable on short circuits. When a machine is protected by differential protection, the overcurrent is provided in additional as a back-up and on some cases to protect the machine from sustained through fault. - Series connected trip coils operating switches devices. - Over-current relays in conjunction with current transformers. - The protection should not operate for starting current, permissible Over-current, current surges. To achieve this, the time delay is provided (in case of inverse relay). If time delay can not be permitted, high set instantaneous relaying is used. - The protection should be co-ordinated with neighbouring Over-current protection so as to discriminate. Motor protection. Over-current protection is the basic type of protection used against overload and short circuit in stator winding of motors. Inverse type and instantaneous phase and ground overcurrent relays can be employed for motor above 1000 KW. For small/medium size motor where cost in CT's and protective relays is not economically justified, thermal relays and HRC fuses are employed, thermal relays used overload protection and HRC fuses for short circuit protection. Transformer protection. Transformer are provided with over-current protection against faults, only, when the cost differential relaying can not be justified. However, over-current relays are provided in additional to differential relays to take care of through faults. Temperature indicators and alarms are always provided for large transformers. Small transformer below 500 KVA installed in distribution system are generally protected by drop-out fuses, as the cost of relays plus circuit breaker is not generally justified. - Inverse time over-current relays. Lines can be protected by impedance, or carrier current protection also. Protection of utility equipment. The furnaces, industrial installations, commercial, industrial and domestic equipment are all provided with over-current protection. The choice of relays for over-current protection depends upon the time/current characteristic and other feature desired. The following relays are used. Attached amature type, moving iron type, permanent magnet moving coil type, static. 2. For inverse time characteristic. 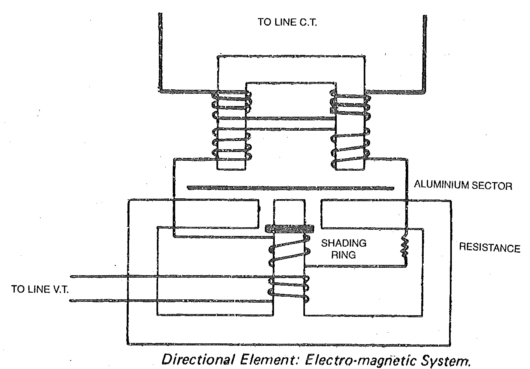 Electromagnetic induction type, permanent magnet moving coil type, static. Double actuating quantity induction relay with directional feature. 5. HRC fuses, drop out fuses, etc.are used in low voltage, medium voltage and high voltage distribution systems, generally upto 11 KV. 6. Thermal relays are used widely for over-current protection. 4. Characteristics for relay units for over-current protection. In inverse characteristic, time is inversely proportional to current i.e. Where n can be between 2 to 8. The choice depends on discrimination desired. Instantaneous relay are those which have no intentional time lag and which operate in less than 0.1 second, usually less than 0.08 second. As such they are not instantaneous in real sense. The relays which are not instantaneous are called "Time Delay Relay. Such relays are provided with delaying means such as drag magnet, dash posts, bellows, escape mechanism, back stop arrangement, etc. 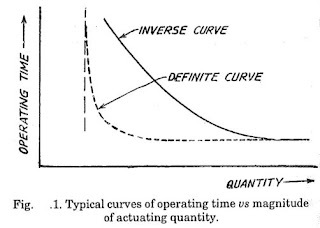 An inverse curve is one in which the operating time; becomes less as the magnitude of the actuating quantity is increased. However for higher magnitudes of actuating quantity the time is constant. 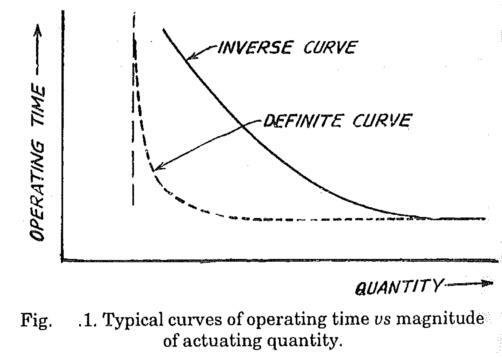 Definite time curve is one in which operating time time is little affected by magnitude actuating current. However even definite time relay has a characteristic which is slightly inverse. Methods of ct connections in over-current protection of 3-phase circuit. Over-current protection can be achieved by means of three over-current relays Fig. 2 or by tow over-current relays Fig. 3. Referring Fig. 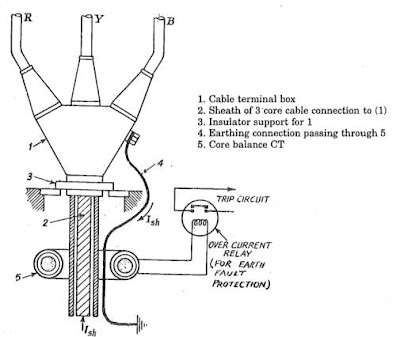 2 the three current transformers and relay coils connected in star and the star point is earthed. When short circuit occurs in the protected zone the secondary current of CT's increase. The current flows through coiler and the relay pick-up. The relay close, thereby the trip circuit is closed and the circuit breaker operates. 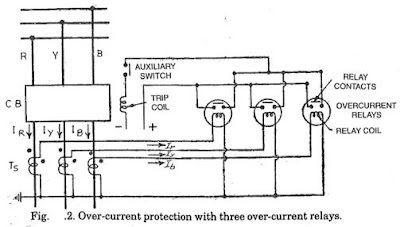 The over-current protection scheme with three over-current relays (Fig. 2) responds to phase faults and earth faults including single phase to earth fault. Therefor such schemes are used with solidly earthed system where phase to phase and phase to earth faults are likely occurs. In Fig. 2 the polarities of CT's are indicated by dots. 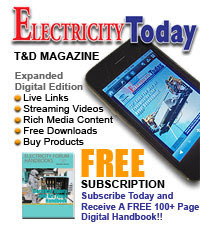 For proper functioning of over-current and earth fault protection, the choice of CT's and polarity connections should be correct. Fig. 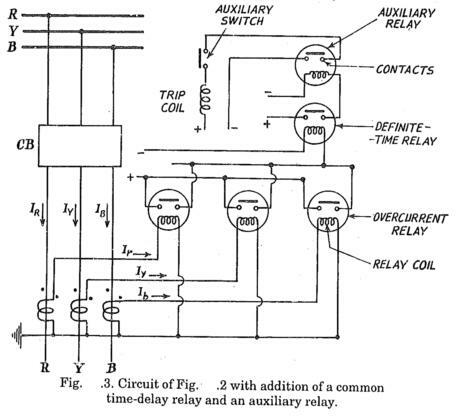 3 illustrates the modified circuit with additional auxiliary relays and a definite time relay. Definite time relay can be set to get desired delay. 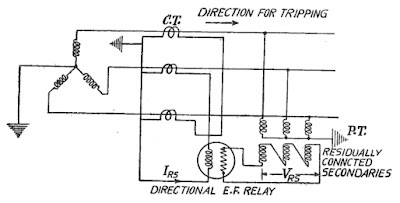 Auxiliary relays is used to close trip circuit. When the fault current flows through earth return path, the fault is called earth fault. Other faults which do not involve earth are called phase faults. Since earth faults are relatively frequent, earth fault protection is necessary in most cases. When separate earth fault protection is not economical, the phase relays sense the earth fault currents. However such protection lacks sensitivity. Hence separate earth fault protection is generally provided. Earth fault protection senses earth fault current. Following are the method of earth fault protection. In absence of earth fault the vector sum of three line currents is zero. Hence the vector sum of these secondary currents is also zero. The sum (Īas + Ībs + Īcs) is called residual current (IRS). 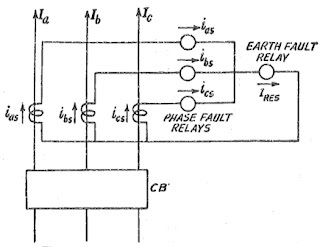 Therefor, the residually connected earth fault relays does not operate. However, in presence of earth fault the condition is disturbed and (Īas + Ībs + Īcs) is no more zero. Hence residual Iresidual flows through the earth fault relay. If residual current is above the pick-up value, the earth fault relay operate. In the scheme discussed here the earth fault at any location near or away from the location of CT's can cause the residual current flow. Hence the protection zone is not definite. Such protection is called unrestricted earth fault protection. For selectivity directional earth fault protection is necessary. 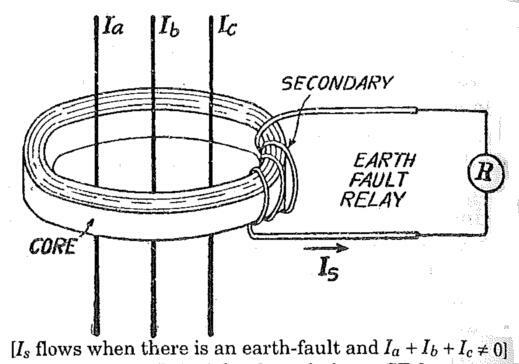 Another method of connecting an earth fault relay is illustrated in Fig. 6. The relay is connected to secondary of a CT whose primary is connected in neutral to earth connection. Such protection can be provided at various voltage levels by connecting earth fault relay in the neutral to earth connection of that of voltage level. The fault current find the return path through the earth and then flows through the the neutral to earth connection. The magnitude of earth fault current is dependent of type of earthing (resistance, reactance or solid) and location of fault. In this type of protection, the zone of protection can not be accurately defined. The protected area is not restricted to transformer/generator winding alone. 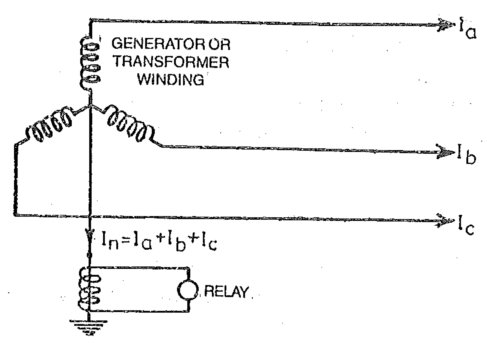 The relay sense the earth faults beyond the transformer/generator winding. Hence such protection is called unrestricted earth fault protection. The earth fault protection by relay in neutral to earth circuit depends upon the type of neutral earthing.. In case of large generators, voltage transformer is connected between neutral to earth. The earth fault relay is connected to secondary of VT. It is convenient to incorporate phase fault relays and earth fault relay in a combined phase fault and earth fault protection (Fig. 7). The increase in current of phase causes corresponding increase in respective secondary currents. The secondary current flows through respective relay units.Very often only toe phase relays are provided instead of three, because in cause of phase faults current in any at least tow phase must increase. Hence tow relay units are enough. 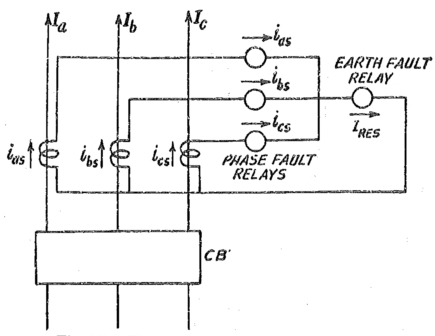 The earth fault relay is residually connected as explained earlier. In this type of protection Fig. 8(a) a single ring shaped core of magnetic material, encircles the conductors of all the three phases. A secondary coil is connected to a relay unit. The cross section of ring core is ample, so that saturation is not a problem. During no earth fault condition, the component of fluxes due to the fields of three conductors are balanced and the secondary current is negligible. During earth faults, such a balance is disturbed and current is inducted in the secondary. Core balance protection can be conveniently used for protection of low voltage and medium voltage system. The burden of relay and exciting current are deciding factors. Very large cross section of core are necessary for sensitivity less than 1A. Thus form of protection is likely to be more popular with static relay due to the less burden of the latter. Instantaneous relay unit is generally used with core balance shcemes. Where, Io is zero sequence current and In is current in neutral to ground circuit. During earth fault the earth fault current flows through return neutral path. For example for single line ground fault. The termination of a three core cable into three separate lines or bus-bars is through cable terminal box. Ref. Fig. 8 (b), the core balance protection is used along with the cable box and should be installed before making the cable joint. The induced current flowing through cable sheath of normal healthy cable need particular attention with respect to the core balance protection. The sheath current (Ish) flow through the sheath to the cover cable box and then to earth through the earthing connection between cable box. 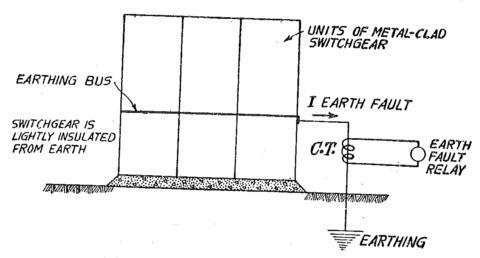 For eliminating the error due to sheath current (Ish) the earthing lead between the cable box and the earth should be taken through the core of the core balance protection. Thereby the error due to sheath current is eliminated. The cable box should be insulated from earth. The meta-clad switchgear can be provided with frame leakage protection. The switchgear is lightly insulated from the earth. The metal frame work or enclosure of the switchgear is earthed with a primary of a CT in between Fig. (9). The concrete foundation of the switchgear and the cable boxes and other conduits are slightly insulated from earth, the resistance to earth being about 12 ohms. 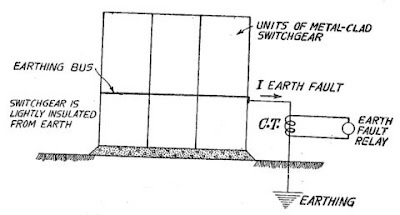 In the event of an earth fault within the switchgear, the earth fault current finds the path through the neutral connection. While doing so, it is sensed by the earth fault relay. Circulating current differential protection also responds to earth faults within its protected zone . 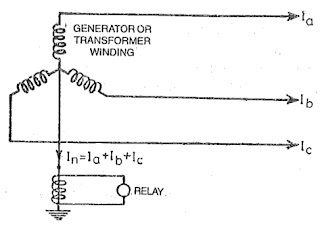 - Relay connected in neutral to ground circuit. - Frame leakage arranged for detecting earth faults on line. - Circulating current differential protection. The over-current protection can be given directional feature by adding directional element in the protection system. Directional over-current protection responds to overcurrents for a particular direction flow. If power flow is in the opposite direction, the Directional over-current protection remains un- operative. Directional over-current protection comprises over-current relay and power directional relay in a single relay casing. The powers directional does not measure the power but is arranged to respond to the direction of power flow. Directional operation of relay is used where the selectivity can be achieved by directional relaying. The directional relay recognizes the direction in which fault occurs, relative to the location of the relay. It is such that it actuates for faults occurring in one direction only. It does not act for faults occurring in the other direction. Consider a feeder XY (Fig. 10.) passing through subsection A. The circuit breaker in feeder AY is provided with a directional relay 'R' which will trip the breaker CBy, if fault power flow in direction A, alone, therefor for faults in feeder AX, the circuit breaker CBy does not trip unnecessarily. However for faults in feeder Ay the circuit breaker CBy trips because its protective relaying in set with a directional feature to act in direction Ay. 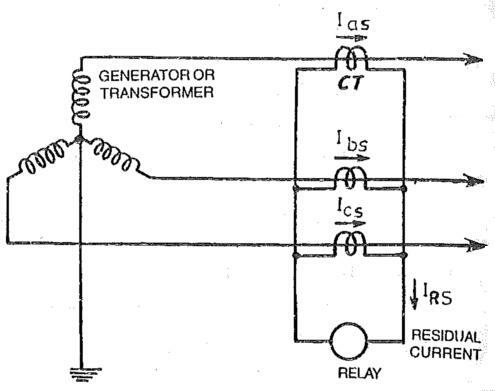 Another interesting example of directional protection is that of reverse power protection of generator (Fig. 11) . If the prime mover fails, the generator continues to run as a motor and takes power from bus-bar. Directional power protection operates in accordance with the direction of power flow. Reverse power protection operates when the power direction is reversed in relation to the normal power flow. 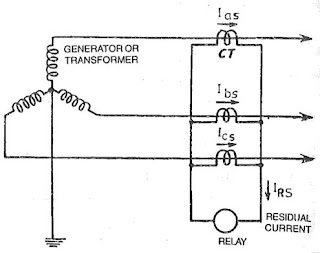 Reverse power relay is different in construction than directional over-current relay. In directional over-current relay, the directional current does not measure the magnitude of power. It senses only direction of power flow. However, in Reverse Current Relays, the directional element measures magnitude and direction of power flow. The current coils in the directional over-current relay (Fig. 12) are normally connected to a secondary line of a CT. The voltage coil of directional element is connected to a line VT, having phase to phase output (of 11o V). There are four common method of connecting the relay depending upon phase angle between current in the current coil and voltage applied to the voltage coil.. The maximum torque angle refers to the angle between the current applied to the relay and the voltage applied to the relay to produce maximum torque. The choice of relay connection is basically to select the phase across which the voltage coil is connected wit respect to current coil. Number of different connections can be used. The suitability of each connection should be examined by considering the limiting condition of voltage and current for limiting fault conditions, source and line impedances etc. In the Directional earth fault protection the current coil of relay is actuated from secondary current of line CT. whereas the current coil of directional earth fault relay is actuated by residual current. where Vae, Vbe and Vce are phase voltages. Φ = Angles between IRES, VRES. α = Angle of maximum torque. 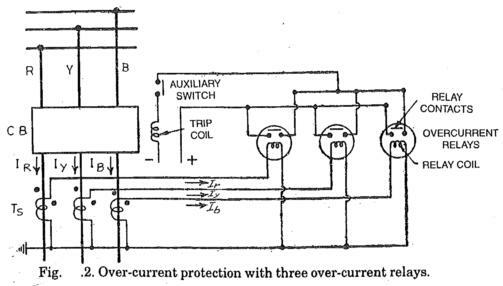 Over-current protection responds to increase above the pick-up value over-currents are caused by overloads and short circuits. The over-current relays are connected the secondary of current transformer. The characteristic of over-current relays includes inverse time characteristic, definite time characteristic. Earth fault protection responds to single line to ground faults and double line to ground faults. 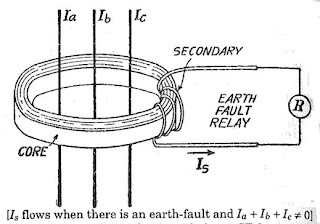 The current coil of earth fault relays is connected either in neutral to ground circuit or in residually connected secondary CT circuit. 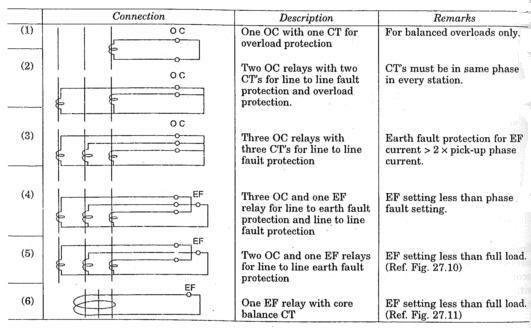 Core balance CTs are used for earth fault protection. Frame leakage protection can be used for metal-clad switchgear. Directional over-current relay and directional earth fault relay responds to fault in which power flow is in the set direction from the CT and PT locations. Such directional relays are used when power can flow both directions to the fault point. In case of unbalancing of loads the current will bath throw neutral to earth, hence maybe this current will activate the earth fault relay. In this case the false fault how could be avoided?